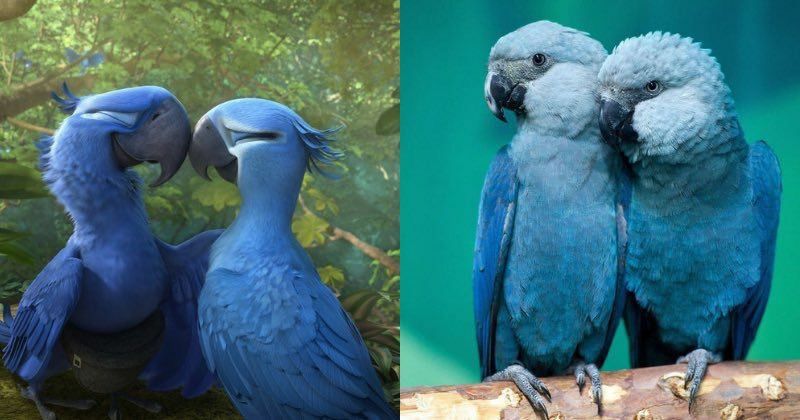 The Spix’s macaw featured in the 2011 animated film ‘Rio’, is officially extinct in the wild, claims a study conducted on extinct birds. The Brazilian bird is one among the 8 bird species declared extinct or suspected to be extinct now. The 2011 animated adventure-comedy film Rio quickly became a fan favorite for its vibrant tones and the charming lead character Blu, a Spix’s macaw who travels thousands of miles in an attempt to save his dying species. Although Blu found his happy ending on screen, the same cannot be said for the Spix’s macaw in real life. A study conducted by BirdLife International claims the Brazilian bird is now extinct in the wild. The Spix’s macaw is one among the eight bird species which have been confirmed or suspected to be extinct by the study. According to a report by CNN, among the eight bird species either confirmed or suspected to be extinct, half them are natives of Brazil. As per the study, deforestation is said to be the leading cause the Spix’s macaw’s disappearance from its natural habitat. Other listed causes include the creation of a dam and trapping for wild trade. The research also revealed that for the first time ever, extinctions on the mainland are outpacing those on islands. Stuart Butchart, BirdLife’s chief scientist, and the paper’s lead author said, “Ninety percent of bird extinctions in recent centuries have been of species on islands.”He added, “However, our results confirm that there is a growing wave of extinctions sweeping across the continents, driven mainly by habitat loss and degradation from unsustainable agriculture and logging.” The study begins by calling back to the 2011 animated film, in which Blu arrives in Brazil to mate with the last-known wild member of his species, a female named Jewel. Although Blu was successful in finding himself a mate and thereby saving his species, the study claims that if it were real-life, Blu would’ve been unsuccessful as he was already 11 years too late.It stated that Jewel, aka the last of her kind, is likely to have perished in or around the year 2000. The study conducted over eight years made use of a new statistical approach to analyze 51 critically endangered species. It quantified 3 factors at once, namely the intensity of threats, timing and reliability of records, and the timing and quantity of search efforts for the species. Of the eight confirmed or suspected extinctions, five took place on the South American continent, while the others were in Brazil. Their findings reflected the staggering effects of the high levels of deforestation taking place in these parts of the world.